If we wander down cobbled Merton Street we will avoid the traffic on the High Street and find ourselves almost at the entrance to C.S. Lewis’ Magdalen College. First we will stop at the botanic gardens—a hidden secret in Oxford. Not only did the fictional Sebastian Flyte stroll through the gardens, but Lewis Caroll loved spending time there, and until recently an ancient Black Pine grew here which was the inspiration for J.R.R. Tolkien’s ent, Treebeard. Watch your step as you cross the busy high street to enter Lewis land. You can visit the chapel at Madgalen where he worshipped daily and as you pass through the quad to the left through an archway you will see the “New Buildings” where C.S. Lewis kept the rooms where he would tutor his students and where the Inklings would head after the pubs closed to continue their rowdy meetings. Did you know the poet John Betjeman was a student of both C.S. Lewis and T.S. Eliot? Lewis at Magdalen and Eliot when Betjeman was a boy at Highgate School where Eliot taught for one unhappy year. Turl St. and "The Mitre"
If we go up the High Street a bit further and turn right we will come into the delightful little street called “The Turl,” which links the High Street to the Broad. 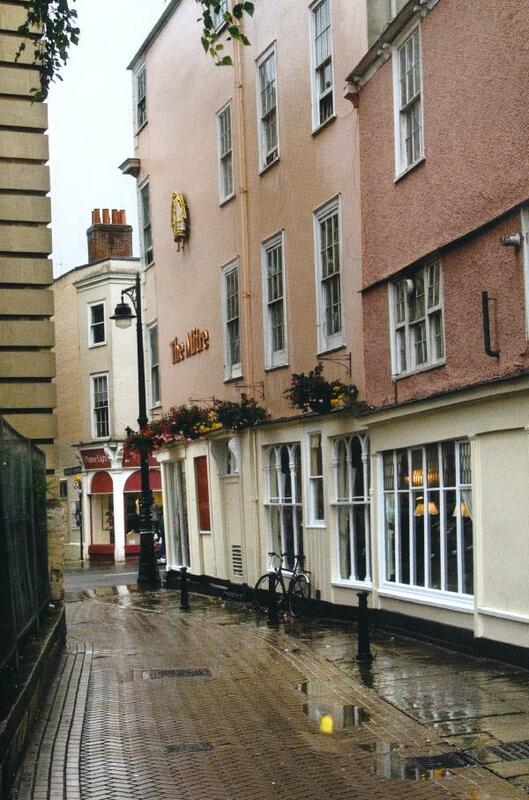 .... As we go up the Turl we will peep into Lincoln College on the right. That is where John Wesley was a fellow and where Methodism got started. .... A bit further down the Turl is Exeter—Tolkien’s college. We will stop in to see the bust commemorating him in the chapel. "An Imaginative Literary Tour of Oxford"